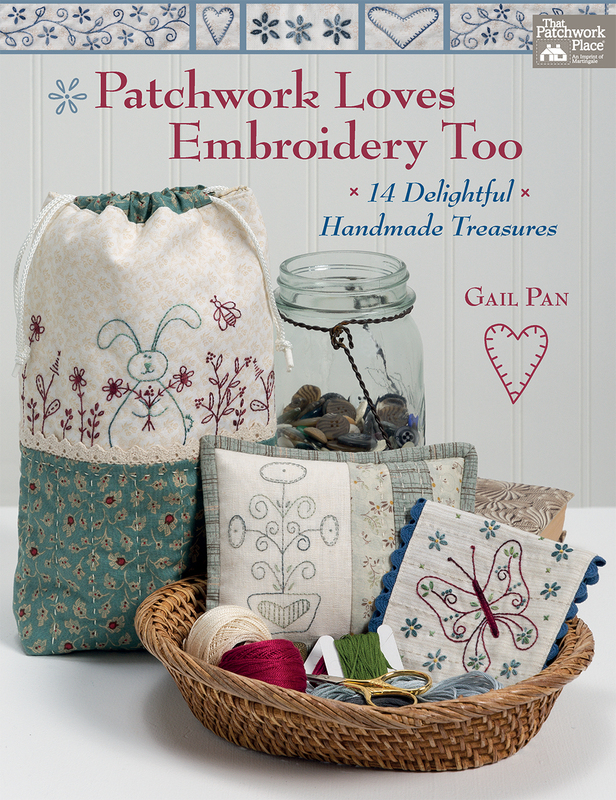 Have you seen Gail Pan's latest book? 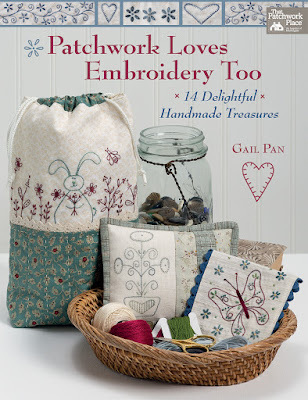 Patchwork Loves Embroidery Too, published by Martingale, has exactly what I need right now: small projects I can embroidery. Except... I am having a tough time figuring out which one to make first! This 16-1/2" x 19-1/2" wall hanging is called "Love and Dreams" (I am so tempted to start here!) and can be customized with your favorite color. The hand quilting on the blue borders is an easy and fast way to finish. 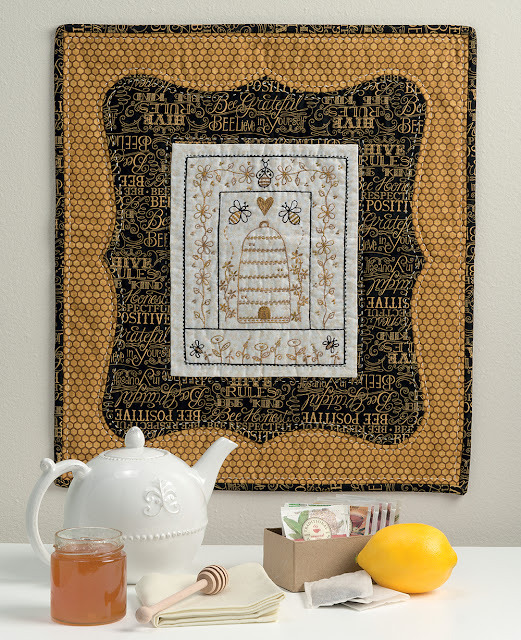 This wall hanging would make a great housewarming gift. "Memories of Sewing" would look great in our sewing room or on that corner of the family room where we usually hand sew. I love Gail's choice of trimmings. The shape of the dark border in "Beautiful Bees" reminds me of old labels in honey jars... How creative! The embroidery was done with black and ecru pearl cotton - no other color needed here, right? 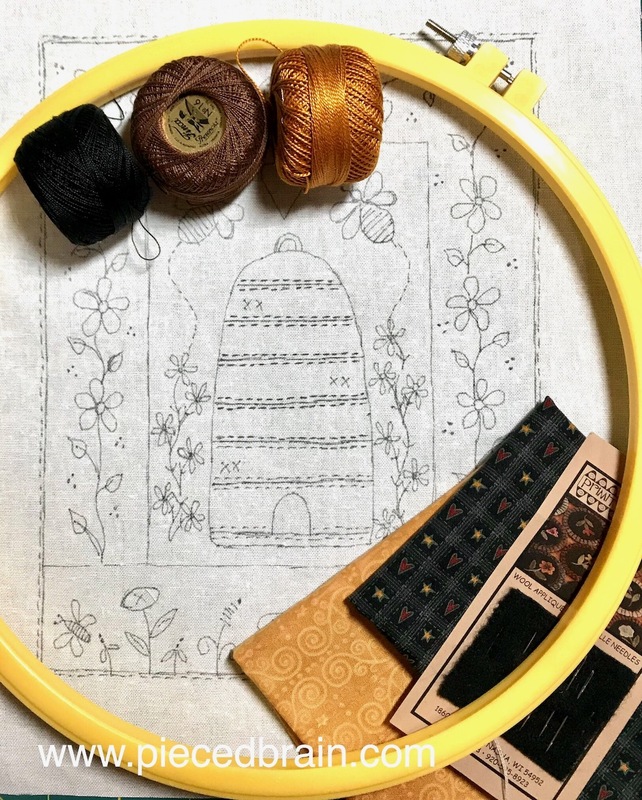 Gail's embroidery designs are simple yet charming. 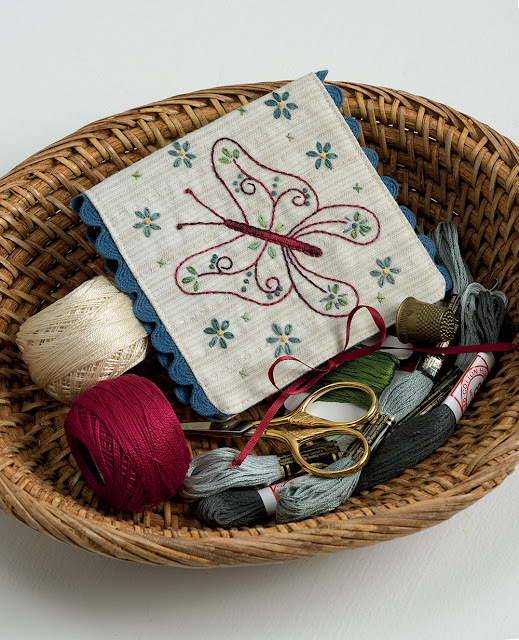 You do not need to be a master embroiderer to make one of them because only 8 simple embroidery stitches are used throughout the book. Should you need help, they are well explained in the General Instructions section. 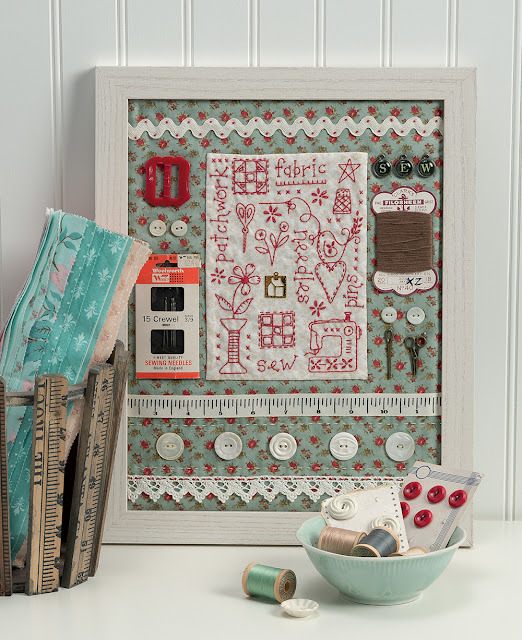 Her designs will add liveness, whimsy, and a touch of color to any home regardless of the season as Patchwork Loves Embroidery Too has motifs related to gardening, sewing, Christmas, Fall and more. 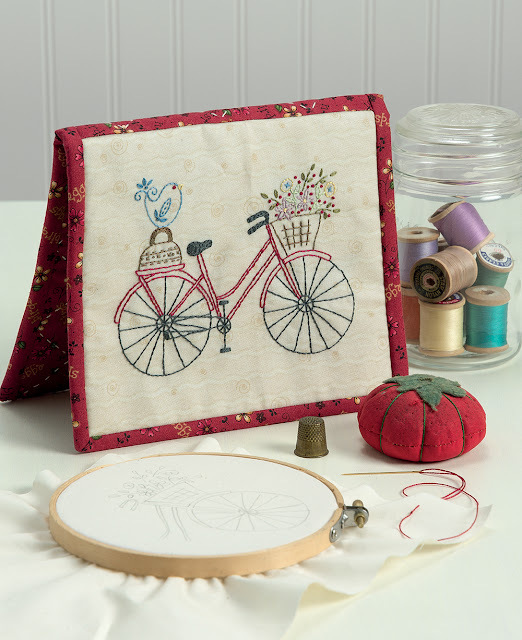 This gorgeous sewing pouch is called "On the Go". 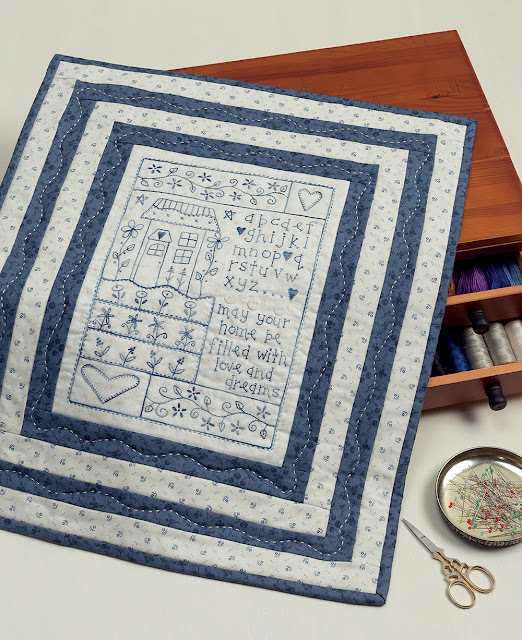 Patchwork Loves Embroidery Too has a total of 14 beautiful projects with Gail's signature embroidery creations beckoning us to put our feet up and relax with needle and thread. After I typed 'relax with needle and thread" I had to stop writing this post as I decided to make "Beautiful Bee": I literally ran downstairs to my studio, traced the lines on linen and chose the threads and the fabrics for the borders. Guess what I will be doing this weekend! I hope your weekend will be as fun as mine. They are! I really love her designs and the details of each project. So beautiful! Thanks for the review. There is so much eye candy in this book, and the best thing about it is that they are easy to make! Your stitching looks so perfect on these beautiful pieces! Carol, I wish I could take credit for them. They are all from her book. I am working on the Bee project and will post it as soon as it is done. Have a great weekend!